Best Trading SoftwareIn order to trade FOREX successfully, you need to have the best trading software. A good charting software and a good terminal to execute your orders are a must-have. You simply cannot trade successfully if you don’t have tools to analyze the market and open/close your positions. Before I continue with the list of FOREX trading software, I want to mention another piece of software you may be missing on your way to success. If you are an experienced trader that has a bullet-proof trading strategy that always works, you are good to go with only charting software and a terminal. But if you are a beginner, or if you like to experiment with different trading strategies and trading systems, you need to have a strategy back-testing software. If you have ever tried to back-test strategies using charts and a piece of paper you know how time-consuming it can be, and how many errors you can make during back-testing. Ok, let’s talk about charting software. For charting, you can use any software that provides you with historical and real-time bar and japanese candle stick charts, and lets you draw trend lines, channels, levels and other graphic objects necessary to analyze the market. You also need to be able to add any necessary known indicators and studies to your charts. For this purpose you can use Meta Trader, Meta Stock and Trade Station software. There are more options, of course, but I am recommending you only the proven software products that I’ve been using myself for quite a while without any problems. Although Meta Stock and Trade Station are very powerful tools that can be extended with various plug-ins, I prefer to use Meta Trader because it combines everything I need in a single easy package, and because it’s free. Meta Trader has excellent charting capabilities, it has an integrated terminal window where you execute and manage your trades, and it is supported by the majority of FOREX brokers as a trading platform. You just install it on your machine and this is pretty much everything you need to analyze the market and trade. Now, lets talk about trading strategy back-testing. Once you come up with an idea and turn it into a trading system, you have to make sure the system works before heading to the real world. 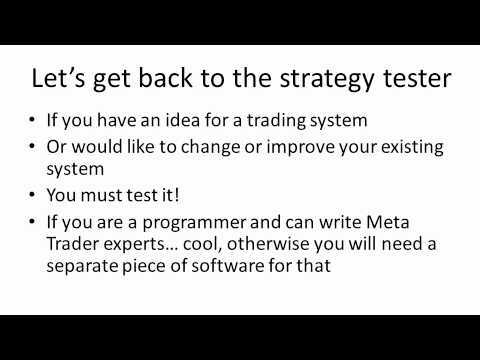 If you have some programming skills and can formalize your trading system, you can use Meta Trader’s strategy tester to back-test it. However, if your system is a part of your brain or personality, or if it cannot be formalized, you need to have a different back-testing tool, which would allow you to manually test your strategies in a time-saving manner. For this purpose, I use Trading Strategy Tester for FOREX. This software package offers extensive charting and lets you manually test your strategies in a very convenient way. You choose a currency pair, open a chart, add all necessary indicators and navigate to a place where you want to start testing. You press the Run button, and simulation begins. From this point, you see how the last candlestick is breathing, and new candlesticks appear on the screen. It looks and feels like you are trading in the real time. You wait for a signal, and open a position or place a delayed order. Then you fast-forward the chart to the point where your position closes, and the software calculates profit and loss for you automatically also taking into consideration spread. Then you fast-forward to quickly get to the next place where you want to open another position, open it and fast-forward again. You repeat this process until you reach the place on the chart where you want to finish testing. Once you stop simulation by pressing the Stop button, you can view your trading report to find all the necessary parameters of your trading system such as average profit, average loss, average profit/loss ratio, maximum drawdown and so on. If you want to download Trading Strategy Tester for FOREX, press the Download button below this post. But now I am giving you a quick overview of the best trading software products. Trading Strategy Tester for FOREX – best for trading system back-testing.